Local Scholarship List- The scholarship list is continuously updated by the counselors from all the schools in our district. Please be mindful of the deadlines and requirements and remember you can never apply for too many scholarships. College is possible for everyone, and a variety of financial aid options are available to help with the costs. As you consider the value of a college education, the U.S. Department of Education has developed a very useful and informative website, studentaid.ed.gov, to help you plot your road to college. Start looking into financial aid during your junior year of high school. Read the Fund Your Future guide published by the California Student Aid Commission, which is available in many languages. As of October 1, 2016 you are are now able to complete the FASFA It is strongly encouraged to complete the FASFA as soon as possible, you do not have to be accepted into the schools you applied to before applying. Each year, we participate in a program that identifies all seniors who may be eligible for a CalGrant to attend college. If you don't want your daughter or son to have their name and student ID submitted to the California Student Aid Commission, please fill out this easy Cal Grant Opt Out form online. 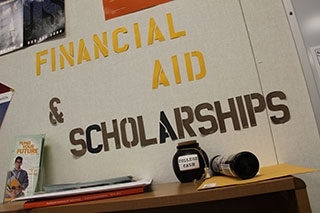 Submit a California Dream Act Application by the March 2 priority deadline each year for maximum financial aid consideration. Incoming students interested in receiving a Cal Grant must submit the GPA Verification Form to the California Student Aid Commission (CSAC) by March 2. You can monitor and manage your Cal Grant account on the CSAC website. Continuing students who have completed at least 36 units at UC Davis will have their GPA automatically submitted to CSAC by March 2. You can monitor and manage your Cal Grant account on the CSAC website. To be considered for institutional work-study, AB540 eligible students must also meet Deferred Action for Childhood Arrivals (DACA) requirements. Entering students will automatically be considered for UC Davis scholarships based on the admissions application. First year and continuing students may submit the scholarship application for the following academic year online between October and early January. For more information on the scholarship application process, including joining the Scholarship Opportunities Listserv, please visit our undergraduate scholarships section. There are many opportunities to receive outside scholarships. For a list of scholarship opportunities, please visit our Outside Scholarships page for AB540 students. The California DREAM Loan Program provides eligible AB540 undergraduates with the option to borrow loans to help cover college expenses while attending UC Davis. Students who demonstrate financial aid eligibility will be offered a DREAM loan. The amount offered may vary based on the academic year and available funding. Additional details on the California DREAM Loan Program are provided by the University of California. Junior Financial Aid Checklist-This checklist will help you feel organized and prepared to enter your senior year and the college and financial aid application process. Senior Financial Aid Checklist-This checklist will guide you in the financial aid process your senior year. The Net Cost of College-The true cost of college and how to plan ahead. Reporting Special Circumstances-This sheet gives examples of what special circumstances are defined as and explains how to report special circumstances. Community Colleges-Many community colleges have the same programs and are more affordable than for-profit systems such as Heald, Wyotech, etc. 13 Common Mistakes That Affect Aid Eligibility-This is a great resource for a parent with young children to seniors.